Q1: I am switching to a new label and now nothing prints. The labels come out blank. If your printer is set up for Direct thermal, place a label on a flat surface. Use a coin or your fingernail and scratch the label applying some pressure. If the scratch mark is a light grey colour then you have Thermal Transfer labels that require a ribbon. If the scratch leaves a dark black mark then these are Direct Thermal. Please contact Datamark Service Centre Team for more information. Q2: How long does the printhead last on your Class Printers? The life of the printhead will depend on the actual usage of the printer. 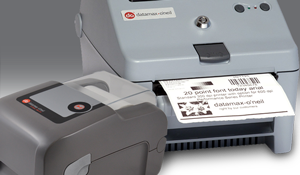 Datamax-O’Neil warranties all Datamax-O’Neil printheads for one year or one million inches limited warranty for any manufacturer’s defect. Factors such as humidity, dust, heat, moisture, and inappropriate usage (in-correct clean and abuse) will shorten the life of the printhead. Datamax-O’Neil advises regular cleaning of the printhead (outline in the Operator’s Manual), be sure to follow proper use and handling to extend the life of your printhead. Q3: My display is on but there is no text. What do I do now? Press and hold the “Menu” button on the far left side. Holding down the menu button controls the display contrast. The adjustment applies to ALL Datamax-O’Neil stationary printers with Display. Q4: Some settings were changed in my printer. How do I set it back to factory details? You can download the Windows Printer Drives from the Technical Resources section. Q5: Some settings were changed in my printer. How do I set it back to factory details? To set the printer back to factory defaults, hold down the Pause, Feed and Cancel buttons simultaneously while powering the printer up. Hold these buttons down until the “System Reset” message is in the display and then release the buttons. This will set the printer back to its default settings. Q6: How often should I clean my printhead? 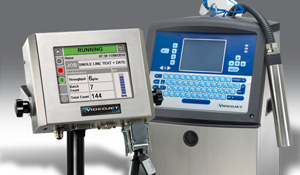 When using Direct Thermal labels, you should clean the printhead after every roll of labels. When using Thermal Transfer with ribbon then clean the printhead when you install a new roll of ribbon. If the printer is in a dirty environment then we recommend cleaning the printhead on a daily basis. Q1: What does CIJ stand for? CIJ stands for Continuous Ink Jet. The printer creates a stream of small ink droplets and selects some of the droplets to print, becoming the characters that land on the product. The unused droplets are cycled back into the printer to eventually become part of the ink stream again. Q2: What is the working principle of CIJ? The CIJ printers charge the individual ink drops that make-up a message. Each drop, with its specific charge, flies through a magnetic field generated inside the printhead. The amount of charge place on the drop determines the amount of deflection it has in this field. The drops that get deflected a little make up the lower lines of code or the lower drops of a single line character. The drops that do not get any charge do not get deflected and land inside the printhead and go back into the ink system. Q3: What applications are recommended for CIJ? CIJ printers can be used for print on Paper products, plastics, metal, glass and others. Typical applications include Milk containers, Soda cans, pharmaceuticals, small cardboard boxes, cabling, and small component marking. Q4: What is the difference between CIJ and contact coders? CIJ printers do not ever touch the product. CIJ printers spray the ink through the air one drop at a time in a pattern that, when a moving product passes, prints the code as programmed in the printer. Typical distance from the printer’s print head to the product is a 3/16 of an inch. Q1: Is there a free “Trial” version available? Absolutely! Our free Trial Edition works like a full-working version of BarTender for 30 days and is available for download below. (After this time, you can still continue creating templates, but you will need to purchase the full-working version in order to continue printing). Q2: How do I move an activated copy of BarTender (or the Seagull License Server) from one computer to another? Moving an activated copy of the software is a simple two-step process. First, make sure that you have your Product Key Code on hand, as you will need this to activate the product on your new computer. Once you have that, simply deactivate the software from the computer it is currently activated on by accessing the Activation Wizard in BarTender’s Help menu. Then use your product key code to activate the software on the new computer using the same activation wizard. 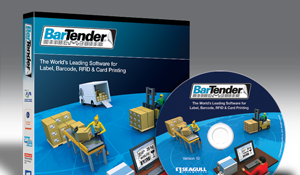 See the BarTender Software Activation sheet in the Resource Centre for more information. If your barcodes will only be used for an internal process, you should choose the barcode that best suits your needs based on the type of data being encoded, the amount of data being encoded, and the device from which it will be scanned. If you are creating barcodes that will be used outside your company, you should check with the company or industry council to see what requirements they have. Q4: What versions of Windows are your printer drivers compatible with? The newest “Drivers” by Seagull are fully compatible with all editions of Windows XP, Vista, Windows 7, Windows 8, and Windows 8.1 as well as Windows Server 2003, 2008 R2, 2012 and 2013 R2, including 32 and 64 bit version. Q5: I can’t get my printer to work. What could be wrong? Many printing problems can be resolved by following the Printer driver self-help located in the Help system of your Seagull printer driver.